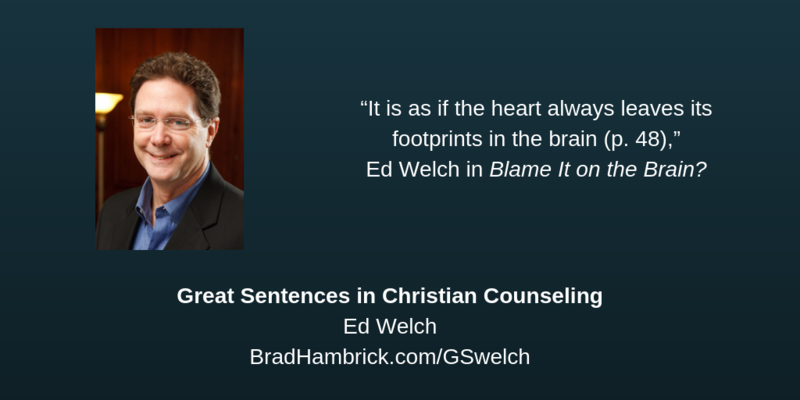 “It is as if the heart always leaves its footprints in the brain (p. 48),” Ed Welch in Blame It on the Brain? What is the relationship between the immaterial mind (i.e., that little voice in our head) and the physical organ called the brain? As research in neuroscience has advanced (something for which we should be immensely grateful), this has become an increasingly complex question to answer. Does the brain just secrete thought? Can consciousness be fully explained by biology? Is trust nothing more than an elevated level of oxytocin? Is love little more than excess dopamine? Let’s keep the conversation away from depression and anxiety for a moment. Let’s begin by reflecting on the relationship between mind and brain as it relates to positive experiences: reflection, trust, and love. We would be willfully naïve in our day of scientific discovery to say that the brain had no role in these human activities. Biologically, the brain is where reflection, trust, and love happen. We can even get more specific. Reflection happens in the prefrontal cortex region of the brain. Much of the experience of love and trust occur in the amygdala. Damage or malfunctioning in these areas of the brain would disrupt/change our experience of reflection, trust, and love. In which case, we would be grateful for any medical intervention which would restore normal functioning to these brain regions and bring some degree of relief to these disruptions. Does this mean that the soul / will / mind have no role in reflection, trust, and love? This does not have to be the conclusion. We can acknowledge the profound effects of the brain without neglecting the role of mind. This is why I appreciate the quote, and the larger book from which it comes, by Ed Welch. It acknowledges the two way relationship between the mind and brain. Our biology places limitations upon our spirituality and our spirituality influences our biology. For instance, a person with autism will be, to some degree, limited in their ability to form the relational attachment of trust; or, a person with a severe learning disability will be, to some degree, limited in how much they understand the Christian faith. The phrase we really want to understand is “to some degree.” How much? And, how much can we influence this degree? To answer this question we need to wrestle with the implications of both brain / biology and soul / will. The severity of the biological abnormality will determine the range of change that is possible. The choices of the mind will determine how much possible change will be realized. As I read Welch’s book, this sentence helped me succinctly articulate this reality. As Christians we can (and should) fully acknowledge with appreciation what scientists have learned in the brain sciences. Anything that restores more of God’s design for human flourishing in this life should be celebrated. We can (and should) also have faith in the role that the mind has upon the brain. The heart leaves its footprints upon the brain and the brain is the control center for human experience. There need to not be competition between these two realities.